The Verso paper mill in Bucksport on Wednesday. 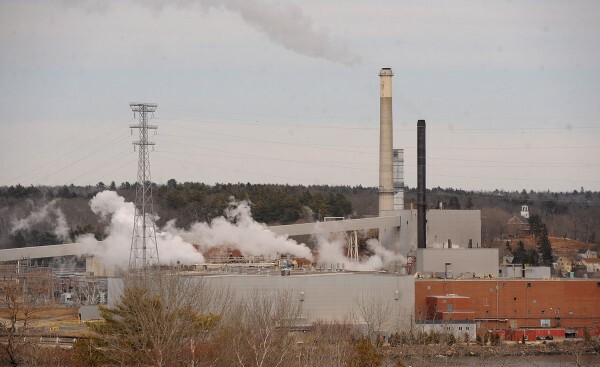 BUCKSPORT, Maine — In the wake of a report publicly released April 2 about biomass-burning power generators, some are criticizing the report and others are defending the use of biofuels as a comparatively “clean” and sustainable technology. The report from the Partnership for Policy Integrity examines emissions from biomass-burning power generators and criticizes government policies that promote the technology. It claims permitted emissions from biomass-burning facilities such as one at the local Verso Paper mill that began operating in 2012 are “dirtier” than those permitted at modern coal plants. Critics say the report makes false assumptions and, from a wider environmental standpoint, neglects a key issue — namely, the impact of mining and other practices used to obtain nonrenewable fossil fuels used in other power generation facilities. Bill Cohen, spokesman for the Bucksport mill, said Wednesday in a brief statement that “bad data and faulty assumptions” have been used in the PFPI report and others like it. The Biomass Power Association, a trade industry group, had some of the harshest criticism of the report, calling it an “81-page editorial” that demonstrates a “fundamental misunderstanding” of the science surrounding forestry and biomass and the governmental policies that regulate them. Dr. Mary Booth, director of PFPI and author of the report, said Saturday that the focus of the report is on what type and amount of emissions are being approved by state and federal governments, how biomass emissions compare to other fuels on a megawatt-hour basis, and how biomass projects are being subsidized under government programs that promote “green” energy. Booth acknowledged that the group reviewed a biomass permit issued to Madison Paper Industries, located in the Somerset County town of Madison, even though the permitted biomass boiler was never built. The absence of the boiler, she said, is irrelevant to the issue of supposed “green” projects permitted and subsidized by government programs. She did not discount the environmental benefits of harvesting trees instead of mining for coal or fracking for natural gas, but she again said those activities are outside the scope of the report. Given the emissions of biomass boilers, she said, it makes no sense to lump the technology in with other “green” power generation methods such as wind, solar and geothermal, which generate no emissions at all. Marc Cone, director of air quality for Maine Department of Environmental Protection, defended the state’s support of the biomass project at the Verso mill in Bucksport. Without referring to the PFPI report, Cone said that the installation of the biomass burner at the mill has resulted in a “significant reduction” in the mill’s emissions. Prior to the installation of the biomass boiler, the mill used coal and fuel derived from tires, he indicated Friday in an email. It is no longer permitted to do so. “The facility configuration today results in the lowest emissions ever [at the Bucksport mill] and which are well within the state and federal air quality standards,” Cone wrote. He added there are no “black-and-white” solutions for how mills generate power and, instead of focusing on any one type of emission, DEP considers the overall environmental impact of each plant.